B. Thomas (Arlington, Texas, United States) on 21 January 2019 in Animal & Insect. Swimming and snorkeling with sharks and stingrays was something I definitely wanted to experience in French Polynesia’s clear blue waters so we signed up for a lagoon tour. When we stopped many black tip reef sharks and stingrays started circling the boat. After we got in the water I stayed close to our guide at first but then it was so fantastic that I forgot to be afraid. 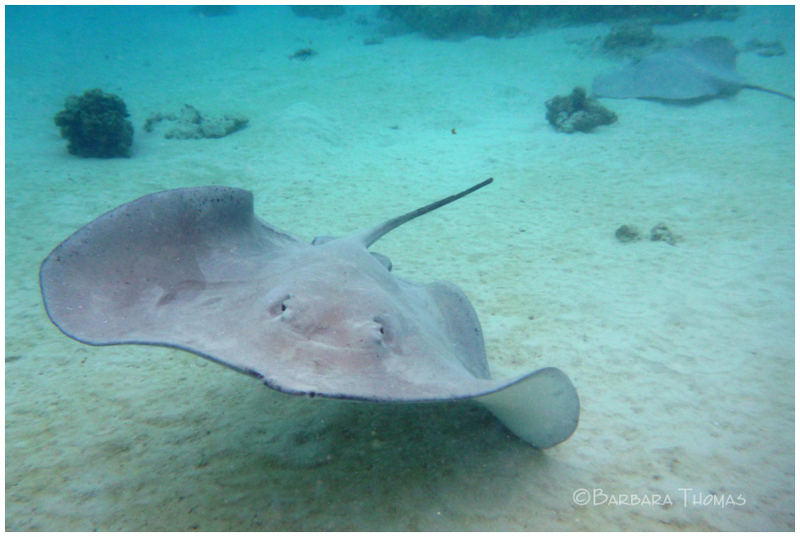 The rays are supposed to be docile creatures as long as you don’t step on their tails or swim directly over them. We got to feed the rays, but when the circling sharks moved in closer the guide put the food away because the sharks could become aggressive around food. Hopefully they didn't see US as food! It was a remarkable and memorable experience. Your photo reminds me of my boat trip on the islands of Bora Bora and Moorea. I could also observe them from a glass bottom boat, it's beautiful. A fabulous capture. Well taken under water. yes ! it's good ! What a story and image....fantastic to be allowed to participate. Must have been a great experience when this dream came true. Oh what a wonderful image and experience you must have had. On Saturday I watched a television nature program showing the life of the rays. Very interesting marine animal. What a great underwater shot of this stingray!! That had to have been quite an experience!! @sherri: Yes, we were in the water with them. It was an awesome experience. a fabulous image of this great adventure! A spectacular image! They are beautiful! A fabulous under water image. I remember petting a sting ray at the Monterey Bay Aquarium years ago. A splendid image of this great adventure! Nice underwater photo. You are brave!